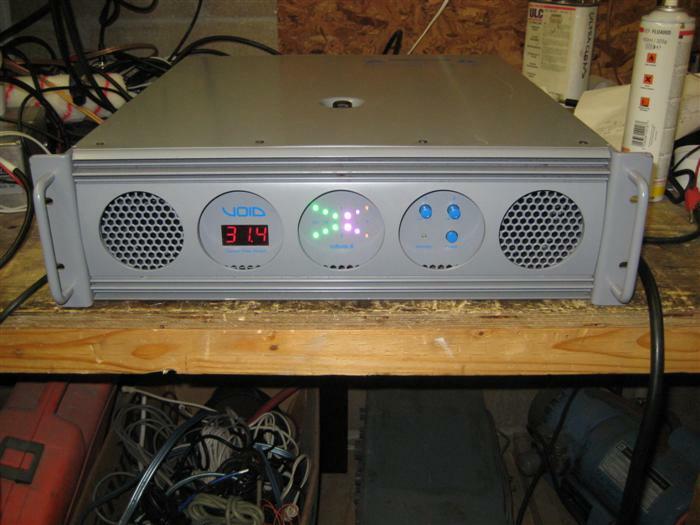 Heavyweight amplifier from Void Acoustics, bigger brother to the mk1 amp as repaired here. Very powerful and good performance with very low distortion even at maximum power, threshold of clipping. Limiter disabled for testing. 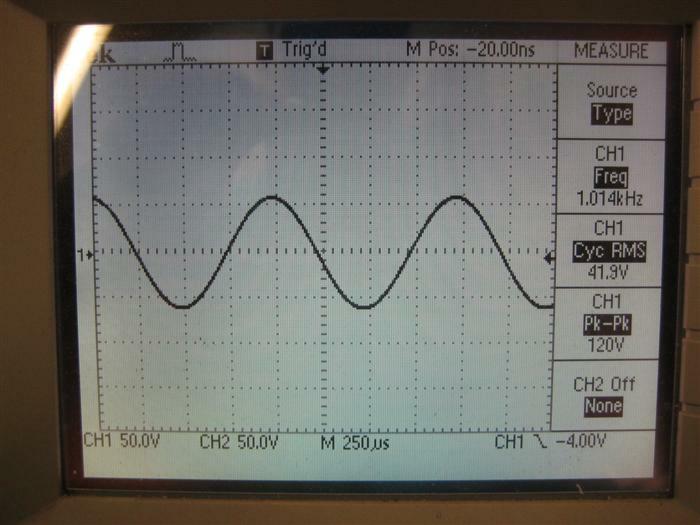 40Hz testing caused some audible modulation with 50Hz mains coming from the amplifier transformer (transformer hum) and a very small amount of 50Hz ripple was present on the waveform crests (visible at all frequencies at the threshold of clipping) suggesting a very stiff power supply. *2R continuous sine testing caused current limiting and activation of the amplifier's SOA circuitry leading to premature clipping on the negative parts of the waveform. This occurred at near full power, and as a result two measurements are given below. 2R continuous measurements are the upper figures in the 2R column of the table, and should be considered long-term continuous outputs. This is the level beyond which the SOA protection circuitry would activate. 2R 100ms burst ratings are the figures in the table marked with an asterisk. All in all, a very sturdy amplifier exhibiting low distortion, plenty of power, and excellent behaviour at clipping. 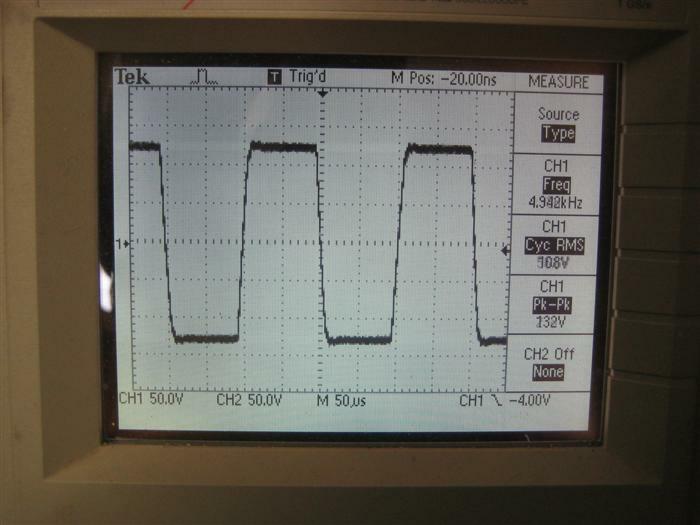 The photos below show a selection of output signals; all frequencies and load impedances yielded similar performance. Frankly, nothing untoward. Tested 29-06-2010, Mains voltage was especially high today, 248V with no load, 246V under 8R testing (full power, both channels) and fell to 232V under 2R testing. Amplifier fed from 32A supply. Mains fuse in rear of amplifier did not blow during testing. Current limiting at 2R on negative side of the waveform on both channels, hence asterisked burst ratings as given above. The amplifier sits quiescent on a messy bench. 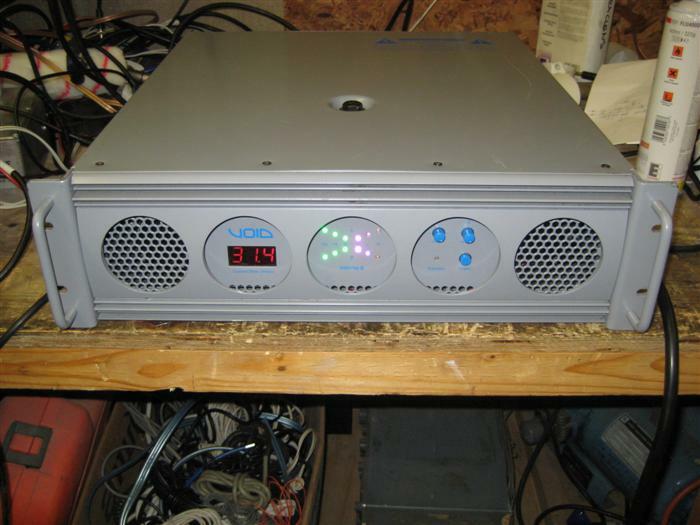 Shot of the front of the amplifier - full power, 4R testing. 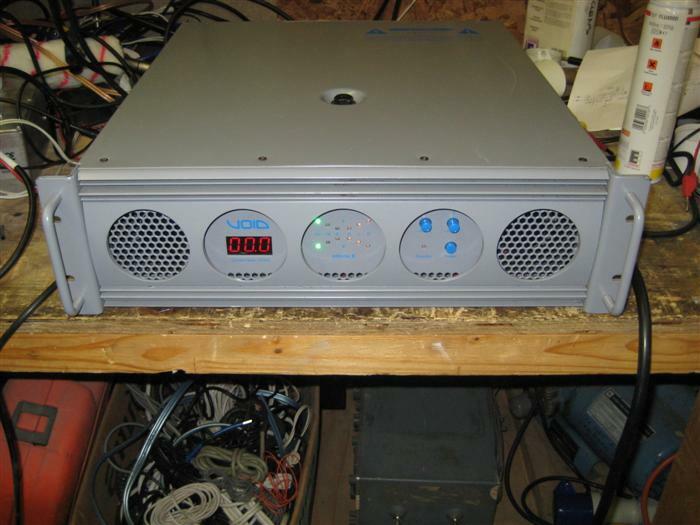 Another shot of the front of the amplifier - full power, 4R testing. 5kHz Sine wave, 4R, threshold of clipping. Very clean and very low distortion. 5kHz Triangle wave, 4R, threshold of clipping. Again, very clean indeed. 1kHz Square Wave, 4R, threshold of clipping. Virtually perfect: No overshoot, undershoot or ringing, fast rise and fall times. 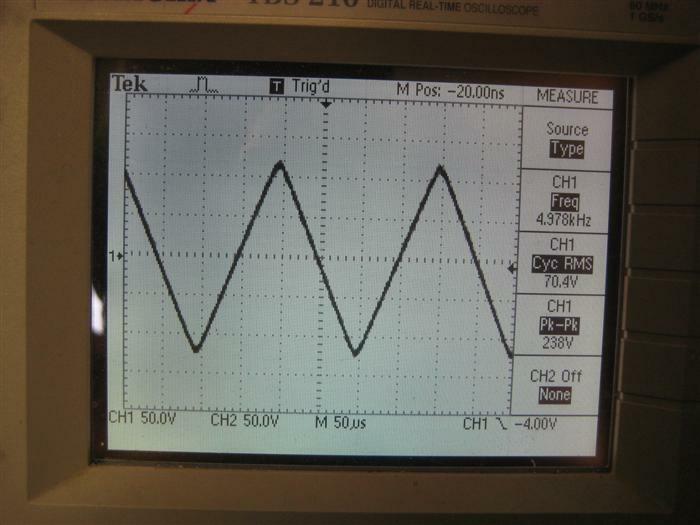 Slanting of top and bottom of waveform probably caused by high pass filtering action of input coupling capacitors. 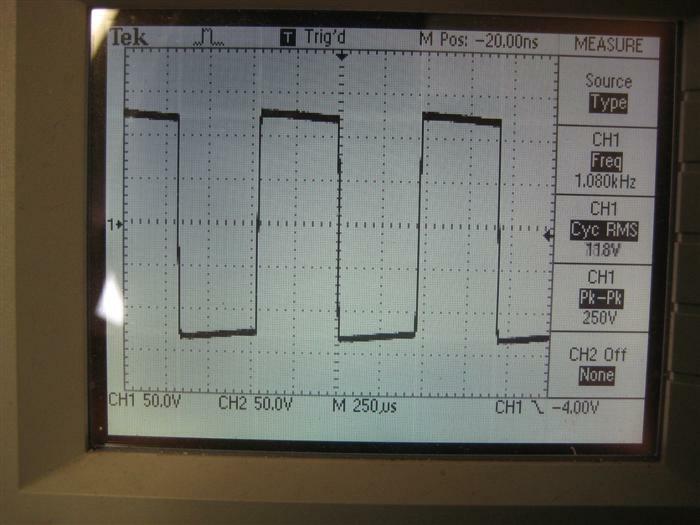 Thickening of top and bottom of square wave is minimal power supply ripple. 5kHz Square Wave, 4R, threshold of clipping. Again, almost perfect: No overshoot, undershoot or ringing, relatively fast rise and fall times. 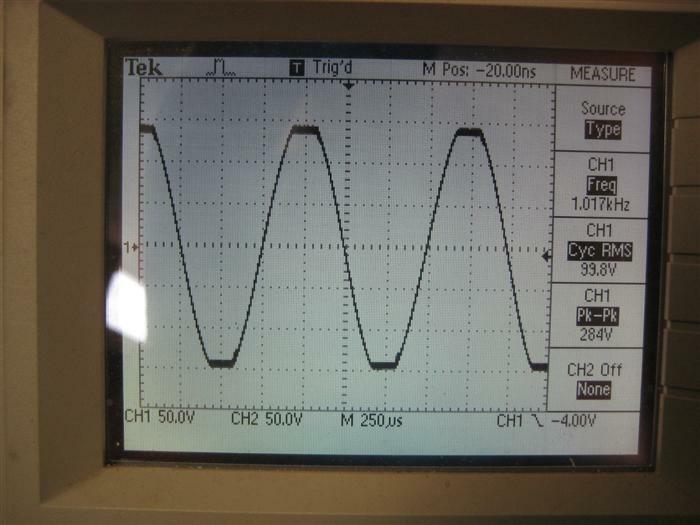 Thickening of top and bottom of square wave is minimal power supply ripple. 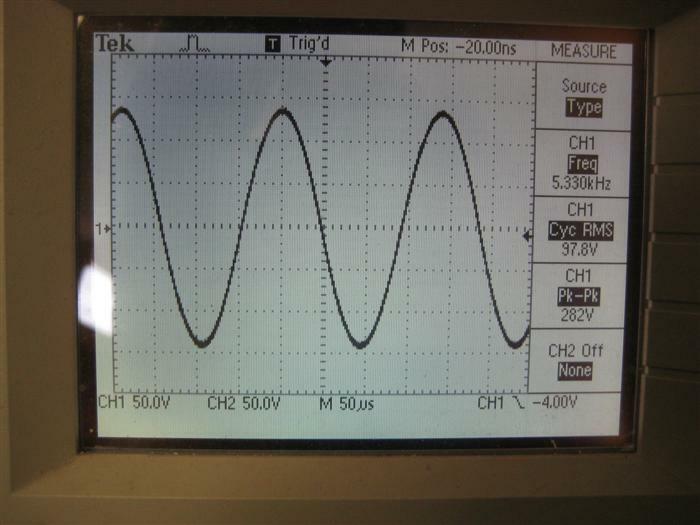 Low level 1kHz sine wave, 4R. Visually distortion-free. 1kHz Sine wave, 4R, threshold of clipping. Very good, as it should be. 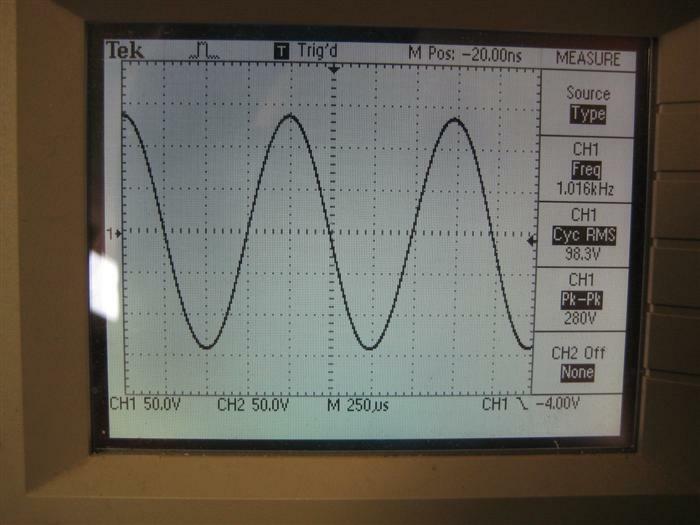 1kHz Sine Wave, 4R, at clipping. Excellent clipping behaviour, merely waveform flattening and no nasties where the waveform flattens off.